"WHAT IS YOUR DANGEROUS IDEA?" "WHAT DO YOU BELIEVE IS TRUE EVEN THOUGH YOU CANNOT PROVE?"" The natural gift of consciousness should be treasured all the more for its transience. The answers...exert an un- questionable morbid fascination — those are the very ideas that scientists cannot confess in their technical papers. God (or Not), Physics and, of Course, Love: Scientists Take a Leap: Fourteen scientists ponder everything from string theory to true love. Space Without Time, Time Without Rest: John Brockman's Question for the Republic of Wisdom—It can be more thrilling to start the New Year with a good question than with a good intention. That's what John Brockman is doing for the eight time in a row. Singolare inchiesta in usa di un sito internet. Ha chiesto ai signori della ricerca di svelare i loro "atti di fede". Sono arrivate le risposte piu' imprevedibili i fantasmi dello scienziato: non ho prove ma ci credo. Scientists, increasingly, have become our public intellectuals, to whom we look for explanations and solutions. These may be partial and imperfect, but they are more satisfactory than the alternatives. Bangladesh—The cynic and the optimist, the agnostic and the believer, the rationalist and the obscurantist, the scientist and the speculative philosopher, the realist and the idealist-all converge on a critical point in their thought process where reasoning loses its power. "So now, into the breach comes John Brockman, the literary agent and gadfly, whose online scientific salon, Edge.org, has become one of the most interesting stopping places on the Web. He begins every year by posing a question to his distinguished roster of authors and invited guests. Last year he asked what sort of counsel each would offer George W. Bush as the nation's top science adviser. This time the question is "What's your law?" "John Brockman, a New York literary agent, writer and impresario of the online salon Edge, figures it is time for more scientists to get in on the whole naming thing...As a New Year's exercise, he asked scores of leading thinkers in the natural and social sciences for "some bit of wisdom, some rule of nature, some law-like pattern, either grand or small, that you've noticed in the universe that might as well be named after you." "John Brockman has posted an intriguing question on his Edge website. Brockman advises his would-be legislators to stick to the scientific disciplines." "Everything answers to the rule of law. Nature. Science. Society. All of it obeys a set of codes...It's the thinker's challenge to put words to these unwritten rules. Do so, and he or she may go down in history. Like a Newton or, more recently, a Gordon Moore, who in 1965 coined the most cited theory of the technological age, an observation on how computers grow exponentially cheaper and more powerful... Recently, John Brockman went looking for more laws." "What are the pressing scientific issues for the nation and the world, and what is your advice on how I can begin to deal with them?" "In 2002, he [Brockman] asked respondents to imagine that they had been nominated as White House science adviser and that President Bush had sought their answer to 'What are the pressing scientific issues for the nation and the world, and what is your advice on how I can begin to deal with them? 'Here are excerpts of some of the responses. " "Edge's combination of political engagement and blue-sky thinking makes stimulating reading for anyone seeking a glimpse into the next decade." "There are 84 responses, ranging in topic from advanced nanotechnology to the psychology of foreign cultures, and lots of ideas regarding science, technology, politics, and education." "Brockman's thinkers of the 'Third Culture,' whether they, like Dawkins, study evolutionary biology at Oxford or, like Alan Alda, portray scientists on Broadway, know no taboos. Everything is permitted, and nothing is excluded from this intellectual game." "The responses are generally written in an engaging, casual style (perhaps encouraged by the medium of e-mail), and are often fascinating and thought - provoking.... These are all wonderful, intelligent questions..."
"We are interested in thinking smart,'" declares Brockman on the site, "we are not interested in the anesthesiology of wisdom.'" "INSPIRED ARENA: Edge has been bringing together the world's foremost scientific thinkers since 1998, and the response to September 11 was measured and uplifting." "Responses to this year's question are deliciously creative... the variety astonishes. 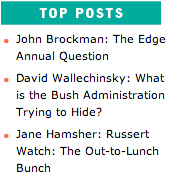 Edge continues to launch intellectual skyrockets of stunning brilliance. Nobody in the world is doing what Edge is doing." "Once a year, John Brockman of New York, a writer and literary agent who represents many scientists, poses a question in his online journal, The Edge, and invites the thousand or so people on his mailing list to answer it." "What Is Today's Most Important Unreported Story?" "Don't assume for a second that Ted Koppel, Charlie Rose and the editorial high command at the New York Times have a handle on all the pressing issues of the day.... a lengthy list of profound, esoteric and outright entertaining responses. "What Is The Most Important Invention In The Past Two Thousand Years?" "A terrific, thought provoking site." "The Power of Big Ideas"
"The Nominees for Best Invention Of the Last Two Millennia Are . . ."
"What Questions Are You Asking Yourself?" "A site that has raised electronic discourse on the Web to a whole new level.... Genuine learning seems to be going on here." "To mark the first anniversary of [Edge], Brockman posed a question: 'Simply reading the six million volumes in the Widener Library does not necessarily lead to a complex and subtle mind," he wrote, referring to the Harvard library. "How to avoid the anesthesiology of wisdom?' "
"Home to often lively, sometimes obscure and almost always ambitious discussions." "I can answer the question, but am I bright enough to ask it?" Something radically new is in the air: new ways of understanding physical systems, new ways of thinking about thinking that call into question many of our basic assumptions. A realistic biology of the mind, advances in evolutionary biology, physics, information technology, genetics, neurobiology, psychology, engineering, the chemistry of materials: all are questions of critical importance with respect to what it means to be human. For the first time, we have the tools and the will to undertake the scientific study of human nature. What you will find emerging out of the 119 original essays in the 75,000 word document written in response to the 2006 Edge Question — "What is your dangerous idea?" — are indications of a new natural philosophy, founded on the realization of the import of complexity, of evolution. Very complex systems — whether organisms, brains, the biosphere, or the universe itself — were not constructed by design; all have evolved. There is a new set of metaphors to describe ourselves, our minds, the universe, and all of the things we know in it. Welcome to Edge. Welcome to "dangerous ideas". Happy New Year. Most of the contributors appear to have interpreted "dangerous" as meaning something like "subversive," challenging to one or another received orthodoxy. ... In that spirit, here is my dangerous idea: Every child in school deserves an individual IQ test. ... And the corollary: Every statistical analysis of school- and district-level data should include individual IQ as one of the variables measured. ... Why is that subversive? Because so many people, especially in education, are terrified to admit that individual IQ has anything to do with academic achievement, because it is not evenly distributed demographically. Seit nunmehr neun Jahren startet die Stiftung Edge mit einer Umfrage zu einem großen generellen Thema ins neue Jahr. 172 Wissenschaftler haben diesmal geantwortet. Sie geben preis, was sie für ihre gefährlichste Idee halten, die wahr werden könnte. La afirmación políticamente más incorrecta, a cuyo autor pueden acusarlo de racista si no de nazi, es que hay grupos humanos cuyas características genéticas los hacen más inteligentes que otros. Lo malo es que esto lo afirman algunos científicos al contestar a la pregunta que hace cada año The Edge (www.edge.org), órgano de un club de sabios de todo el planeta que se plantean problemas aparentemente simples que son comple- jísimos. La cuestión de 2006, que responderán hasta 2007 miles de investigadores, la presentó Steven Pinker, psicolingüista, profesor de psicología en Harvard. Recuerda Pinker que la historia de la ciencia está repleta de descubrimientos que fueron considerados social, moral y emocionalmente peligrosos; los más obvios, la revolución copernicana y la darwiniana. With the aim of gathering ideas from the world's leading thinkers on intellectual, philosophical, artistic and literary issues, US writer John Brockman established The Edge Foundation in 1988. Since 1997, Edge has been running on the Internet (www.edge.org), and every year poses a question in its The World Question Centre. Royal Society president Martin Rees said the most dangerous idea was public concern that science and technology were running out of control. "Almost any scientific discovery has a potential for evil as well as for good; its applications can be channelled either way, depending on our personal and political choices; we can't accept the benefits without also confronting the risks. The decisions that we make, individually and collectively, will determine whether the outcomes of 21st century sciences are benign or devastating." Professor Rees argues that the feeling of fatalism will get in the way of properly regulating how science progresses. "The future will best be safeguarded — and science has the best chance of being applied optimally — through the efforts of people who are less fatalistic." What is a dangerous idea? One not assumed to be false, but possibly true?What do you believe is true even though you cannot prove it?" These are the questions of the last two years that Edge Foundation asked of 120 free thinkers. The audacious and stimulating answers have been reproduced by in hundreds of newspapers such as The New York Times or Frankfurter Allgemeine Zeitung. Among the hundreds of ideas are the demonstration of life in other planets, or that life has been a unique chance of existing; concerns over the fact that there are genetic differences relating to intelligence between ethnic groups and between the sexes; the inference that global warming is not so worrisome, the notion that there are alternatives to the free market. The results (collected at www.edge.org) give an insight into how philosophically minded scientists are thinking: the result is somewhere between a multi-disciplinary seminar and elevated high table talk. The responses to Brockman's question do not directly engage with each other, but they do worry away at a core set of themes. Many agree that neuroscience at the micro level and evolutionary psychology at the macro level have abolished free will. Richard Dawkins is typical: "Assigning blame and responsibility is an aspect of the useful fiction of intentional agents that we construct in our brains as a means of short-cutting a truer analysis of what is going on in the world." Holding people responsible for their behaviour is, in his view, completely irrational. Theories of social nets and their relationship with the contemporary sociology, dangerous ideas of scientists on Radio3 Scienza on Radio3. Forget for a moment the substance of the arguments in defense of Darwin, Intelligent Design and the Bible. These arguments will take care of themselves in real time, by the clock and according to the calendar. No one proves or disproves any of the theories about the origin of our planet. But how we choose to conduct these debates, the knowledge we bring to the argument, is crucially important. Intellectual revolutions have a way of changing how we think. The way we frame the argument, the idols, gods or the God we celebrate, ultimately informs politics and dictates policy. You could visit a provocative cyber salon known as The Edge (www.edge.org) to test yourself against the edgiest thinking on these subjects. John Brockman, who likes being described as a "cultural impresario," poses a question every year that would tempt an answer from Dr. Faustus. This year he asks contributors for "dangerous ideas." "The history of science is replete with discoveries that were considered socially, morally, or emotionally dangerous in their time; the Copernican and Darwinian revolutions are the most obvious," he writes. "What is your dangerous idea? An idea you think about (not necessarily one you originated) that is dangerous not because it is assumed to be false, but because it might be true?" What is the worst thing that could go wrong with our society? ...Richard Dawkins, of Oxford University, said our increased understanding of how our brains work would lead to difficult questions in defining morality. "As scientists, we believe that human brains, though they may not work in the same way as man-made computers, are as surely governed by the laws of physics," Dawkins said. Der New Yorker Literatur-Agent John Brockman schafft es immer wieder zum Jahreswechsel, auf seiner Website einen "Think Tank" aus namhaften Wissenschaftlern und KŸnstlern zu versammeln. Viele Dutzend Persšnlichkeiten der unterschiedlichsten Fachrichtungen antworten ihm jeweils auf eine bestimmte Frage. Diesmal bat Brockman seine Adressaten um "gefŠhrliche Ideen", die schon bald vielleicht Šhnliche Verwerfungen bewirken kšnnten wie die Darwinsche Evolutionstheorie oder die Kopernikanische Revolution. Wir stellen kurze Auszuge, die Kernthesen, aus einigen Antworten vor. Edge.org canvassed scientists for their "most dangerous idea." David Buss, a psychologist at the University of Texas, chose "The Evolution of Evil." The dangerous idea is that all of us contain within our large brains adaptations whose functions are to commit despicable atrocities against our fellow humans — atrocities most would label evil. The danger comes from people who refuse to recognize that there are dark sides of human nature that cannot be wished away by attributing them to the modern ills of culture, poverty, pathology, or exposure to media violence. Each Christmas, the Manhattan literary agent John Brockman gives his pals a "riddle me this." A year ago he brain-teased: "What do you believe is true even though you cannot prove it?" And this time: "What is your dangerous idea?" Free will does not exist. We are not always created equal. Science will never be able to address our deepest concerns. These are just three of some of the most controversial theories advanced by some of the world's leading thinkers in answer to the question: "What is your dangerous idea?" The survey, conducted by the New York-based Website The Edge, produced 116 responses that were all the more striking for being put forward by experts in relevant fields. Nobel Laureate Eric Kandel argues, for instance, that by observing someone's brain activity we know what they're going to do even before they do, which begs the question "Is one to be held responsible for decisions that are made without conscious awareness?" Free will, he says, is therefore an illusion. Geneticist J. Craig Venter argues that "there are strong genetic components associated with most aspects of human existence", from intelligence to willpower, and that a growing awareness of these essential inequalities will lead to more social conflict. "The danger rests with what we already know: that we are not all created equal." He asked his roster of thinkers - V.S. Ramachandran, Paul Davies, Daniel Dennett, Jared Diamond, Daniel Goleman, Matt Ridley, Simon Baron-Cohen, Mihaly Csikszentmihalyi and Martin Seligman, among the most famous - to nominate an idea, not necessarily their own, they consider dangerous not because it is false, but because it might be true. Who controls humans? God? The genes? Or nevertheless the computer? The on-line forum Edge asked its yearly question — and the answers raised more questions. 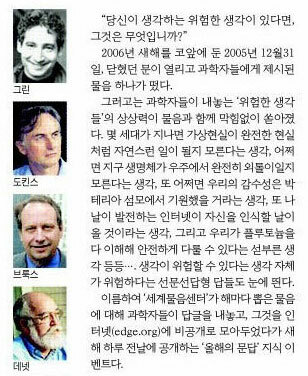 Once a year self-styled head of the Third Culture movement and New York literary agent John Brockman asks his fellow thinkers and clients a question, who publishes their answers every New Year's Day in his online forum edge.org. Thus Mr. Brockman fulfills the promise that is the basic principle of Third Culture. The sciences are asking mankind's relevant questions he says, while the humanities busy themselves with ideological skirmishes and semantic hairsplitting. It is about having last words, which have never been as embattled as in the current context of post-ideological debates and de-secularization. That's why this year's question 'What is your dangerous idea' seemed unusually loaded. Since it's inception in 1998 the forum had mainly dealt with the basic questions of science culture per se. But maybe that's why this year the debate has brought out the main concerns of Third Culture more direct than in the years before. poder-ho demostrar?”. Amb l’any nou, coneixeremla nova pregunta i, sobretot, les noves respostes. Mankind's increasing understanding of the way genes influence behaviour and the issue's potential to cause ethical and moral dilemmas is one of the biggest dangers facing society, according to leading scientists. The concerns were voiced as part of an exercise by the web magazine Edge, which asked more than 100 scientists and philosophers: "What is your dangerous idea?". The responses were published online yesterday. Craig Venter, founder of the J Craig Venter Science Foundation, said the genetic basis of personality and behaviour would cause conflicts in society. He said it was inevitable that strong genetic components would be discovered at the root of many more human characteristics such as personality type, language capability, intelligence, quality of memory and athletic ability. "The danger rests with what we already know: that we are not all created equal," he said. • THERE IS ONE dangerous idea that still trumps them all: the notion that, as Steven Pinker describes it, “groups of people may differ genetically in their average talents and temperaments”. For “groups of people”, read “races”. The Earth can cope with global warming, schools should be banned and we should learn to love bacteria. These are among the dangerous ideas revealed by a poll of leading thinkers. 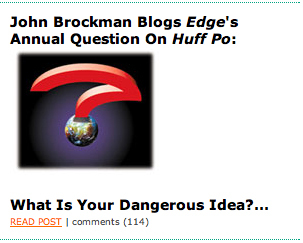 ohn Brockman, the New York-based literary agent and publisher of The Edge website posed the question: what is your dangerous idea? in reference to a controversial book by the philosopher Daniel Dennett that argued that Darwinism was a universal acid that ate through virtually all traditional beliefs. EDGE.org annual question: What is your dangerous idea? Each year, John Brockman at Edge.org asks some of the brightest minds in science and technology to consider one question. This year: What is your dangerous idea? Our brains are constantly subjected to the demands of multi-tasking and a seemingly endless cacophony of information from diverse sources. Cell phones, emails, computers, and cable television are omnipresent, not to mention such archaic venues as books, newspapers and magazines. What you will find emerging out of the 117 essays written in response to the 2006 Edge Question — "What is your dangerous idea?" — are indications of a new natural philosophy, founded on the realization of the import of complexity, of evolution. Very complex systems — whether organisms, brains, the biosphere, or the universe itself — were not constructed by design; all have evolved. There is a new set of metaphors to describe ourselves, our minds, the universe, and all of the things we know in it. According to myth, Pandora unleashed all evils upon the world; only hope remained inside the box. Hope for human survival and progress rests on two assumptions: (1) Human constructive tendencies can counter human destructive tendencies, and (2) Human beings can act on the basis of long-term considerations, rather than merely short-term needs and desires. My personal optimism, and my years of research on "good work", could not be sustained without these assumptions. Yet I lay awake at night with the dangerous thought that pessimists may be right. For the first time in history — as far as we know! — we humans live in a world that we could completely destroy. The human destructive tendencies described in the past by Thomas Hobbes and Sigmund Freud, the "realist" picture of human beings embraced more recently by many sociobiologists, evolutionary psychologists, and game theorists might be correct; these tendencies could overwhelm any proclivities toward altruism, protection of the environment, control of weapons of destruction, progress in human relations, or seeking to become good ancestors. As one vivid data point: there are few signs that the unprecedented power possessed by the United States is being harnessed to positive ends. Strictly speaking, what will happen to the species or the planet is not a question for scientific study or prediction. It is a question of probabilities, based on historical and cultural considerations, as well as our most accurate description of human nature(s). Yet, science (as reflected, for example, in contributions to Edge discussions) has recently invaded this territory with its assertions of a biologically-based human moral sense. Those who assert a human moral sense are wagering that, in the end, human beings will do the right thing. Of course, human beings have the capacities to make moral judgments — that is a mere truism. But my dangerous thought is that this moral sense is up for grabs — that it can be mobilized for destructive ends (one society's terrorist is another society's freedom fighter) or overwhelmed by other senses and other motivations, such as the quest for power, instant gratification, or annihilation of one's enemies. I will continue to do what I can to encourage good work — in that sense, Pandoran hope remains. But I will not look upon science, technology, or religion to preserve life. Instead, I will follow Albert Camus' injunction, in his portrayal of another mythic figure endlessly attempting to push a rock up a hill: one should imagine Sisyphus happy. In looking back over the scientific and artistic breakthroughs in the 20th century, there is a view that the great minds relativized the absolute. Did this go too far? Has relativism gotten to a point that it is dangerous to the scientific enterprise and to human well being? The most visible person to say this is none other than Pope Benedict XVI in his denunciations of the "dictatorship of the relative." But worries about relativism are not only a matter of dispute in theology; there are parallel dissenters from the relative in science, in philosophy, in ethics, in mathematics, in anthropology, in sociology, in the humanities, in childrearing, and in evolutionary biology. • In philosophy of science, there is ongoing tension between the Kuhnians (science is about "paradigms," the fashions of the current discipline) and the realists (science is about finding the truth). • In epistemology there is the dispute between the Tarskian correspondence theorists ("p" is true if p) versus two relativistic camps, the coherence theorists ("p" is true to the extent it coheres with what you already believe is true) and the pragmatic theory of truth ("p" is true if it gets you where you want to go). • At the ethics/science interface, there is the fact/value dispute: that science must and should incorporate the values of the culture in which it arises versus the contention that science is and should be value free. • In mathematics, Gödel's incompleteness proof was widely interpreted as showing that mathematics is relative; but Gödel, a Platonist, intended the proof to support the view that there are statements that could not be proved within the system that are true nevertheless. Einstein, similarly, believed that the theory of relativity was misconstrued in just the same way by the "man is the measure of all things" relativists. • In the sociology of high accomplishment, Charles Murray (Human Accomplishment) documents that the highest accomplishments occur in cultures that believe in absolute truth, beauty, and goodness. The accomplishments, he contends, of cultures that do not believe in absolute beauty tend to be ugly, that do not belief in absolute goodness tend to be immoral, and that do not believe in absolute truth tend to be false. • In anthropology, pre-Boasians believed that cultures were hierarchically ordered into savage, barbarian, and civilized, whereas much of modern anthropology holds that all social forms are equal. This is the intellectual basis of the sweeping cultural relativism that dominates the humanities in academia. • In evolution, Robert Wright (like Aristotle) argues for a scala naturae, with the direction of evolution favoring complexity by its invisible hand; whereas Stephen Jay Gould argued that the fern is just as highly evolved as Homo sapiens. Does evolution have an absolute direction and are humans further along that trajectory than ferns? • In child-rearing, much of twentieth century education was profoundly influenced by the "Summerhillians" who argued complete freedom produced the best children, whereas other schools of parenting, education, and therapy argue for disciplined, authoritative guidance. • Even in literature, arguments over what should go into the canon revolve around the absolute-relative controversy. I do not know if the dilemmas in these domains are only metaphorically parallel to one another. I do not know if illumination in one domain will not illuminate the others. But it might and it is just possible that the great minds of the twenty-first century will absolutize the relative. A number of us — biologists, cognitive scientists, anthropologists or philosophers — have been trying to lay down the foundations for a truly naturalistic approach to culture. Sociobiologists and cultural ecologists have explored the idea that cultural behaviors are biological adaptations to be explained in terms of natural selection. Memeticists inspired by Richard Dawkins argue that cultural evolution is an autonomous Darwinian selection process merely enabled but not governed by biological evolution. Evolutionary psychologists, Cavalli-Sforza, Feldman, Boyd and Richerson, and I are among those who, in different ways, argue for more complex interactions between biology and culture. These naturalistic approaches have been received not just with intellectual objections, but also with moral and political outrage: this is a dangerous idea, to be strenuously resisted, for it threatens humanistic values and sound social sciences. When I am called a "reductionist", I take it as a misplaced compliment: a genuine reduction is a great scientific achievement, but, too bad, the naturalistic study of culture I advocate does not to reduce to that of biology or of psychology. When I am called a "positivist" (an insult among postmodernists), I acknowledge without any sense of guilt or inadequacy that indeed I don't believe that all facts are socially constructed. On the whole, having one's ideas described as "dangerous" is flattering. Dangerous ideas are potentially important. Braving insults and misrepresentations in defending these ideas is noble. Many advocates of naturalistic approaches to culture see themselves as a group of free-thinking, deep-probing scholars besieged by bigots. 2) even if some natural inequality were established, it would not come near justifying any inequality in rights, and 3) postmodernists criticizing naturalism on political grounds should begin by rejecting Heidegger and other reactionaries in their pantheon who also have been accomplices of policies of discrimination. This is not enough because the racist and sexist uses of naturalism are not exactly unfortunate accidents. Species evolve because of genetic differences among their members; therefore you cannot leave biological difference out of a biological approach. Luckily, it so happens that biological differences among humans are minor and don't produce sub-species or "races," and that human sexual dimorphism is relatively limited. In particular, all humans have mind/brains made up of the same mechanisms, with just fine-tuning differences. (Think how very different all this would be if — however improbably — Neanderthals had survived and developed culturally like we did so that there really were different human "races"). Given what anthropologists have long called "the psychic unity of the human kind", the fundamental goal for a naturalistic approach is to explain how a common human nature — and not biological differences among humans — gives rise to such a diversity of languages, cultures, social organizations. Given the real and present danger of distortion and exploitation, it must be part of our agenda to take responsibility for the way this approach is understood by a wider public. This, happily, has been done by a number of outstanding authors capable of explaining serious science to lay audiences, and who typically have made the effort of warning their readers against misuses of biology. So the danger is being averted, and let's just move on? No, we are not there yet, because the very necessity of popularizing the naturalistic approach and the very talent with which this is being done creates a new danger, that of arrogance. We naturalists do have radical objections to what Leda Cosmides and John Tooby have called the "Standard Social Science Model." We have many insightful hypotheses and even some relevant data. The truth of the matter however is that naturalistic approaches to culture have so far remained speculative, hardly beginning to throw light on just fragments of the extraordinarily wide range of detailed evidence accumulated by historians, anthropologists, sociologists and others. Many of those who find our ideas dangerous fear what they see as an imperialistic bid to take over their domain. The bid would be unrealistic, and so is the fear. The real risk is different. The social sciences host a variety of approaches, which, with a few high profile exceptions, all contribute to our understanding of the domain. Even if it involves some reshuffling, a naturalistic approach should be seen as a particularly welcome and important addition. But naturalists full of grand claims and promises but with little interest in the competence accumulated by others are, if not exactly dangerous, at least much less useful than they should be, and the deeper challenge they present to social scientists' mental habits is less likely to be properly met. Copernicus and Darwin took away our traditional place in the world and our traditional identity in the world. What traditional trait will be taken away from us next? My guess is that it will be the world itself. We see the first few steps in that direction in the physics, mathematics and computer science of the twentieth century, from quantum mechanics to the results obtained by Gödel, Turing and others. The ontologies of our worlds, concrete as well as abstract, have already started to melt away. The problem is that quantum entanglement and logical incompleteness lack the in-your-face quality of a spinning earth and our kinship with apes. We will have to wait for the ontology of the traditional world to unravel further, before the avant-garde insights will turn into a real revolution. Copernicus upset the moral order, by dissolving the strict distinction between heaven and earth. Darwin did the same, by dissolving the strict distinction between humans and other animals. Could the next step be the dissolution of the strict distinction between reality and fiction? For this to be shocking, it has to come in a scientifically respectable way, as a very precise and inescapable conclusion — it should have the technical strength of a body of knowledge like quantum mechanics, as opposed to collections of opinions on the level of cultural relativism. Perhaps a radical reevaluation of the character of time will do it. In everyday experience, time flows, and we flow with it. In classical physics, time is frozen as part of a frozen spacetime picture. And there is, as yet, no agreed-upon interpretation of time in quantum mechanics. What if a future scientific understanding of time would show all previous pictures to be wrong, and demonstrate that past and future and even the present do not exist? That stories woven around our individual personal history and future are all just wrong? Now that would be a dangerous idea. Psychologist; Founder of Gottman Institute; Author, The Mathematics of Marriage. The most dangerous idea I know of is emotional intelligence. Within the context of the cognitive neuroscience revolution in psychology, the focus on emotions is extraordinary. The over-arching idea that there is such a thing as emotional intelligence, that it has a neuroscience, that it is inter-personal, i.e., between two brains, rather than within one brain, are all quite revolutionary concepts about human psychology. I could go on. It is also a revolution in thinking about infancy, couples, family, adult development, aging, etc. In my area of the arts and humanities, the most dangerous idea (and the one under who's influence I have operated throughout my artistic life) is the complete relativity of all positions and styles of procedure. The notion that there are no "absolutes" in art — and in the modern era, each valuable effort has been, in one way or another, the highlighting and glorification of elements previous "off limits" and rejected by the previous "classical" style. Such a continual "reversal of values" has of course delivered us into the current post-post modern era, in which fragmentation, surface value and the complex weave of "sampling procedure" dominate, and "the center does not hold". I realize that my own artistic efforts have, in a small way, contributed to the current aesthetic/emotional environment in which the potential spiritual depth and complexity of evolved human consciousness is trumped by the bedazzling shuffle of the shards of inherited elements — never before as available to the collective consciousness. The resultant orientation towards "cultural relativity" in the arts certainly comes in part from the psychic re-orientation resulting from Einstein's bombshell dropped at the beginning of the last century. This current "relativity" of all artistic, philosophical, and psychological values leaves the culture adrift, and yet there is no "going back" in spite of what conservative thinkers often recommend. At the very moment of our cultural origin, we were warned against "eating from the tree of knowledge". Down through subsequent history, one thing has led to another, until now — here we are, sinking into the quicksand of the ever-accelerating reversal of each latest value (or artistic style). And yet — there are many artists, like myself, committed to the believe that — having been "thrown by history" into the dangerous trajectory initiated by the inaugural "eating from the tree of knowledge" (a perhaps "fatal curiosity" programmed into our genes) the only escape possible is to treat the quicksand of the present as a metaphorical "black hole" through which we must pass — indeed risking psychic destruction (or "banalization") — for the promise of emerging re-made, in new still unimaginable form, on the other side. This is the "heroic wager" the serious "experimental" artist makes in living through the dangerous idea of radicalized relativity. It is ironic, of course, that many of our greatest scientists (not all of course) have little patience for the adventurous art of our times (post Stockhausen/Boulez music, post Joyce/ Mallarme literature) and seem to believe that a return to a safer "audience friendly" classical style is the only responsible method for today's artists. Do they perhaps feel psychologically threatened by advanced styles that supercede previous principals of coherence? They are right to feel threatened by such dangerous advances into territory for which conscious sensibility if not yet fully prepared. Yet it is time for all serious minds to "bite the bullet" of such forays into the unknown world in which the dangerous quest for deeper knowledge leads scientist and artist alike. Those people who become perpetrators of evil deeds and those who become perpetrators of heroic deeds are basically alike in being just ordinary, average people. The banality of evil is matched by the banality of heroism. Both are not the consequence of dispositional tendencies, not special inner attributes of pathology or goodness residing within the human psyche or the human genome. Both emerge in particular situations at particular times when situational forces play a compelling role in moving individuals across the decisional line from inaction to action. There is a decisive decisional moment when the individual is caught up in a vector of forces emanating from the behavioral context. Those forces combine to increase the probability of acting to harm others or acting to help others. That decision may not be consciously planned or taken mindfully, but impulsively driven by strong situational forces external to the person. Among those action vectors are group pressures and group identity, diffusion of responsibility, temporal focus on the immediate moment without entertaining costs and benefits in the future, among others. The military police guards who abused prisoners at Abu Ghraib and the prison guards in my Stanford Prison experiment who abused their prisoners illustrate the "Lord of the Flies" temporary transition of ordinary individuals into perpetrators of evil. We set aside those whose evil behavior is enduring and extensive, such as tyrants like Idi Amin, Stalin and Hitler. Heroes of the moment are also contrasted with lifetime heroes. The heroic action of Rosa Parks in a Southern bus, of Joe Darby in exposing the Abu Ghraib tortures, of NYC firefighters at the World Trade Center's disaster are acts of bravery at that time and place. The heroism of Mother Teresa, Nelson Mandela, and Gandhi is replete with valorous acts repeated over a lifetime. That chronic heroism is to acute heroism as valour is to bravery. This view implies that any of us could as easily become heroes as perpetrators of evil depending on how we are impacted by situational forces. We then want to discover how to limit, constrain, and prevent those situational and systemic forces that propel some of us toward social pathology. It is equally important for our society to foster the heroic imagination in our citizens by conveying the message that anyone is a hero-in-waiting who will be counted upon to do the right thing when the time comes to make the heroic decision to act to help or to act to prevent harm. From the earliest Babylonian and Chinese moments of "civilization", we have agreed that human affairs depend on an organizing power in the hands of a few people (usually with religious charisma to undergird their authority) who reside in a functionally central location. "Political science" assumes in its etymology the "polis" or city-state of Greece as the model for community and government. But it is remarkable how little of human excellence and achievement has ever taken place in capital cities and around those elites, whose cultural history is one of self-mockery and implicit acceptance of the marginalization of the powerful. Borderlands and frontiers (and even suburbs) are where the action is. But as long as technologies of transportation and military force emphasized geographic centralization and concentration of forces, the general or emperor or president in his capital with armies at his beck and call was the most obvious focus of power. Enlightened government constructed mechanisms to restrain and channel such centralized authority, but did not effectively challenge it. So what advantage is there today to the nation state? Boundaries between states enshrine and exacerbate inequalities and prevent the free movement of peoples. Large and prosperous state and state-related organizations and locations attract the envy and hostility of others and are sitting duck targets for terrorist action. Technologies of communication and transportation now make geographically-defined communities increasingly irrelevant and provide the new elites and new entrepreneurs with ample opportunity to stand outside them. Economies construct themselves in spite of state management and money flees taxation as relentlessly as water follows gravity. Who will undergo the greatest destabilization as the state evaporates and its artificial protections and obstacles disappear? The sooner it happens, the more likely it is to be the United States. The longer it takes ... well, perhaps the new Chinese empire isn't quite the landscape-dominating leviathan of the future that it wants to be. Perhaps in the end it will be Mao who was right, and a hundred flowers will bloom there. Our desire for entertaining virtual realities is increasing. As our understanding of the human brain also accelerates, we will create both imagined realities and a set of memories to support these simulacrums. For example, someday it will be possible to simulate your visit to the Middle Ages and, to make the experience realistic, we may wish to ensure that you believe yourself to actually be in the Middle Ages. False memories may be implanted, temporarily overriding your real memories. This should be easy to do in the future — given that we can already coax the mind to create richly detailed virtual worlds filled with ornate palaces and strange beings through the use of the drug DMT (dimethyltryptamine). In other words, the brains of people who take DMT appear to access a treasure chest of images and experience that typically include jeweled cities and temples, angelic beings, feline shapes, serpents, and shiny metals. When we understand the brain better, we will be able to safely generate more controlled visions. Our brains are also capable of simulating complex worlds when we dream. For example, after I watched a movie about people on a coastal town during the time of the Renaissance, I was “transported” there later that night while in a dream. The mental simulation of the Renaissance did not have to be perfect, and I'm sure that there were myriad flaws. However, during that dream I believed I was in the Renaissance. If we understood the nature of how the mind induces the conviction of reality, even when strange, nonphysical events happen in the dreams, we could use this knowledge to ensure that your simulated trip to the Middle Ages seemed utterly real, even if the simulation was imperfect. It will be easy to create seemingly realistic virtual realities because we don't have to be perfect or even good with respect to the accuracy of our simulations in order to make them seem real. After all, our nightly dreams usually seem quite real even if upon awakening we realize that logical or structural inconsistencies existed in the dream. In the future, for each of your own real lives, you will personally create ten simulated lives. Your day job is a computer programmer for IBM. However, after work, you'll be a knight with shining armor in the Middle Ages, attending lavish banquets, and smiling at wandering minstrels and beautiful princesses. The next night, you'll be in the Renaissance, living in your home on the Amalfi coast of Italy, enjoying a dinner of plover, pigeon, and heron. If this ratio of one real life to ten simulated lives turned out to be representative of human experience, this means that right now, you only have a one in ten chance of being alive on the actual date of today.